After coming across the work of Taysir Batniji, a Palestinian-born, France-based multi-media artist, I’ve been thinking quite a bit about the anxiety of influence in contemporary photography. Documenting the watchtowers the dot the borders of Palestine, Batniji’s 2008 series ‘miradors‘ is directly indebted to the work of Bernd and Hilla Becher, in terms of subject and compositional choice. This is not surprising; as last year’s Düsseldorf School showat the Musée d’Art moderne de la Ville de Paris made clear, the Bechers’ industrial archetypes have cast an exceedingly long shadow over the generation of photographers and conceptual artists that followed. What is interesting is the degree to which many photographers are explicitly using canonical projects as jumping off points for their own work. Batniji’s project is but one example of this. 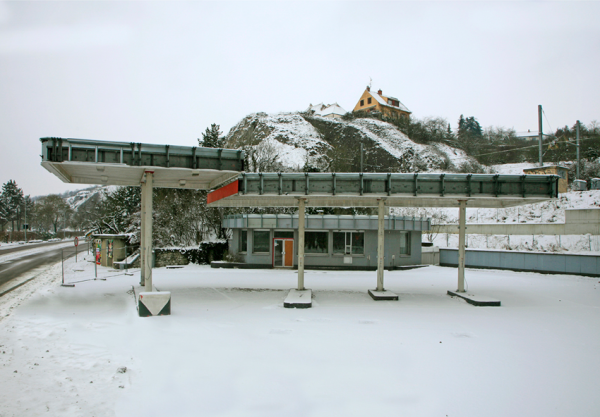 Both Eric Tabuchi and Michalis Pichler have produced work based on Ed Ruscha’s ‘Twentysix Gasoline Stations.’ Tabuchi has completed a second version of his original homage, ‘Twentysix Abandoned Gasoline Stations,’ and has done another, related project called ‘Twenty Six Recycled Gasoline Stations.’ Pichler’s project goes further than Tabuchi’s in its morphological resemblance to Ruscha; his book ‘Twentysix Gasoline Stations‘ is an exact copy of the original Ruscha, with the Route 66 gas stations replaced by the same readymade building photographed as it (re)appears across the autobahns of Germany. The book itself has the same kind of semi-transparent dust jacket, uses identical type on its cover, and employs a very similar layout. Through his use of commercial design and typography, Ruscha hoped to negate any artistic value inhering in his photographs; they were to serve instead as simple ‘technical data [or] facts‘. Like Warhol and Duchamp, Ruscha was interested in what could be mined from the mass-produced surfaces populating the cultural landscapes of his era. In this sense, Pichler’s project is spiritually and formally much closer to Ruscha’s. By only updating Ruscha’s photos, Pichler highlights how the now is just a more mass-produced extension of yesterday, with the exact same replacing the merely similar. Tabuchi’s photos, on the other hand, have an entirely different effect. Because they exist outside the small book format – they can be viewed independently online, and are physically presented as a series of individual prints, encased in a folder – they exist as art objects in-and-of themselves (of course, the same is now true of Ruscha’s little book). And his choice of subject matter is different from Ruscha’s or Pichler’s; Tabuchi captures the aftershocks of industrial downturn, politicizing his work in a way Ruscha would shy away from.